Agriculture minister Han Changfu said on Friday of October 10 that Chinese people should keep their “rice bowls” in their own hands to ensure food security, as massive grain imports will be unsustainable for the nation. In his article published by the Qiushi Journal, the flagship magazine of the Communist Party of China Central Committee, Han said the task to ensure food security remains difficult given the country’s population of 1.3 billion and tight grain supply. “We can’t forget the lessons of starvation from the past and fall into blind optimism now,” the minister wrote, warning the bumper harvests in recent years have not relieved the food security pressure. As the world’s largest grain producer and consumer, China must ensure that 95 percent of its cereal demand and all staple foods, such as rice and wheat, can be supplied by the domestic market, Han said. He dismissed suggestions that imports can meet Chinese demand, saying the global market’s limited capacity, now between 250 million tonnes and 300 million tonnes every year, as well as the political costs, make long-term massive imports unlikely. According to the minister, the global grain trade volume is equal to less than half of Chinese consumption, and the rice trade equal to only one-fourth of its consumption. In the first seven months of 2014, China imported 11.34 million tonnes of cereal, 80 percent more than a year ago, according to customs data. “If we continuously buy grain from international markets in large quantities, food prices may increase sharply,” Han said, adding such costs are too high to afford and will have a negative impact on China’s relations with other grain-importing countries. This dilemma leaves China no choice but to look domestically for food. With less than 10 percent of the world’s farmland, China now produces one-fourth of the world’s grain and can feed its 1.3 billion people on its own, contributing greatly to world food security. The country needs to remain above a “red line” of 120 million hectares of farmland, among which 106 million hectares should be designated for growing grain, according to the minister. 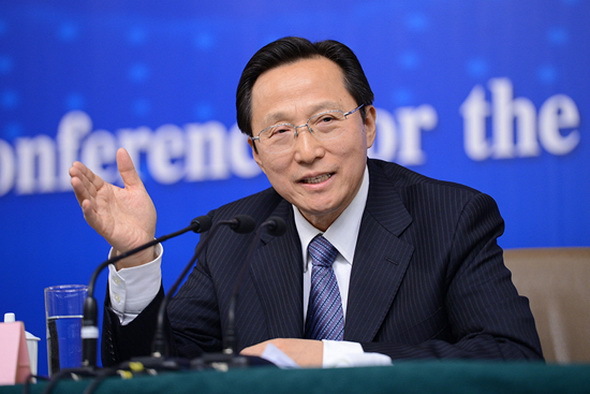 Han said there are major challenges to food security from the rigid demand for farm products, urbanization and rising production costs. The minister expected urbanization to drive up food demand by 10 million tonnes while reducing arable land between 400,000 to 470,000 hectares every year. To reach a self-sufficiency rate of at least 95 percent, the incremental demand has to be met by domestic production, he said, adding that Chinese total grain demand will hit 700 million tonnes by 2020. The country hit a record high in summer grain output with 136.60 million tonnes this year, following total grain output of 601.94 million tonnes last year in a 10-year bumper harvest streak, according to the National Bureau of Statistics.